Leverage the performance and usability of a fully native, mobile DocuSign sending and signing experience in your mobile app. Integrate DocuSign’s eSignature and Digital Transaction Management services into your mobile apps with the DocuSign Mobile SDK (available for iOS). What is the DocuSign Mobile SDK? Add easy-to-use and secure eSignature and transaction capabilities to your apps with the DocuSign Mobile SDK. Sign and complete any document-based transaction directly within your mobile app. Businesses and consumers leverage DocuSign to complete sales/invoicing contracts, account opening forms, employment forms, delivery confirmations, warranty services, and even basic school permission slips. Host “in-person signing sessions” with your app. DocuSign customers and partners are revolutionizing customer service through registration apps for retail storefronts, new customer signups in bank branches, and logistics apps for delivery confirmation. In-person signing sessions will show your customers how easy it is to sign and complete a transaction in seconds. 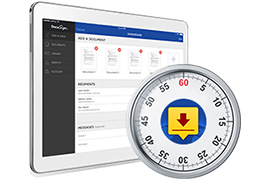 Integrating with DocuSign’s Mobile SDK is fast and easy. Build your first prototype in less than one hour. Get up and running with your first prototype in less than one hour.